Hello, Farm Girl friends! It's Katie here, and I am so glad that you are joining me on the Farm Girl Vintage Sew Along blog hop. 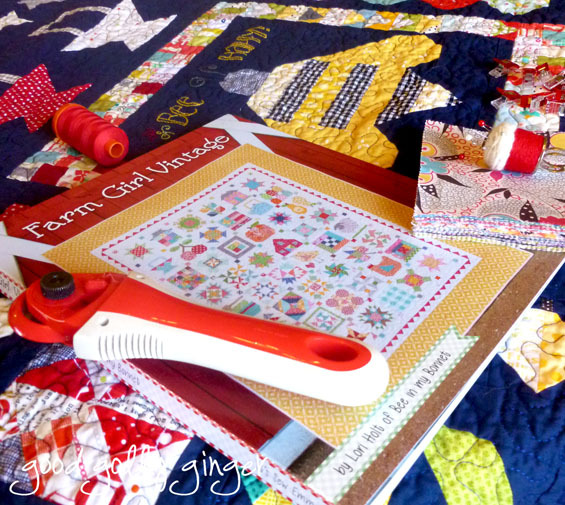 I absolutely love Lori's latest book, Farm Girl Vintage! There are 45 stunning blocks packed into this lovely work...a serious feast for your quilty soul! This week, I made the 12-inch Autumn Star block which can be found on page 9. I started by making one block with a Gardenvale charm pack by Jen Kingwell and Art Gallery Fabrics Pure Elements in Empire Yellow. 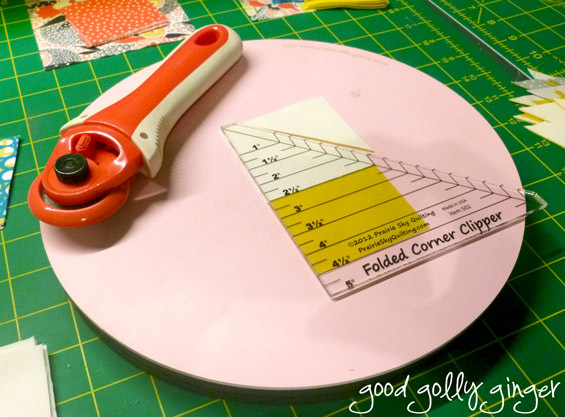 I love the Folded Corner Clipper for all of Lori's patterns. It chops off the corners, leaving a quarter inch seam allowance. No need to draw that diagonal line! So, why not make three blocks?! 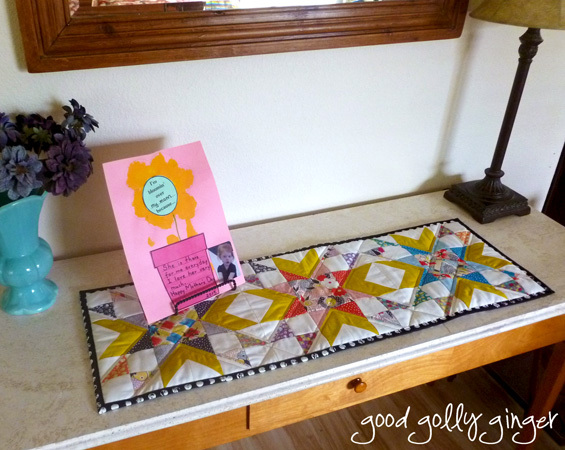 Here is my Autumn Star table runner. It finishes at 12" x 36". I bound it with Sara Lawson's Jungle Ave in Dotted Boulevard. Yes, I did use this blog hop as an excuse to buy macroons. I needed them to make this photo even lovelier (nom nom nom). Thank you so much for stopping by my blog. 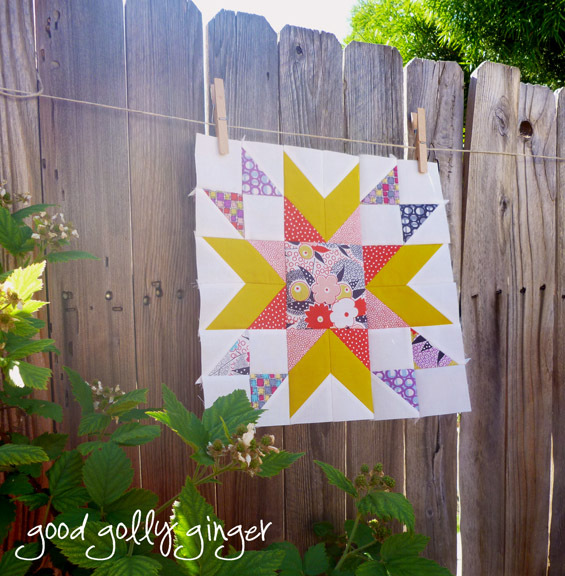 Check out Sew Fresh Quilts today to see Lorna and her adorable baby chick block. I can't wait to see what you make, use #farmgirlfridays. Happy Mother's Day to all you quilty moms out there!!! Enjoy your weekend! Your table runner looks fabulous. I have to say I am a bit daunted by today's block - all those pieces! I will do my best though. Happy Friday! Love your fabric choices for those Autumn Stars. And what a beautiful runner you've turned them into! I had never heard of the Folded Corners Clipper. What a handy tool! Happy Mother's Day weekend to you too! Great fabric choices, Katie! Love that pop for the binding. So glad you linked up to TGIFF! Beautiful table runner Katie and love the fabrics you picked!! It's all so lovely! Loved visiting here today! Thank you so much Katie ...for taking a turn in week two of my Sew Along:) I love your Autumn Star runner and also your fabric choices! Can you please add the link to Week Two of Farm Girl Friday's (my blog) so that your readers will know all of the information? 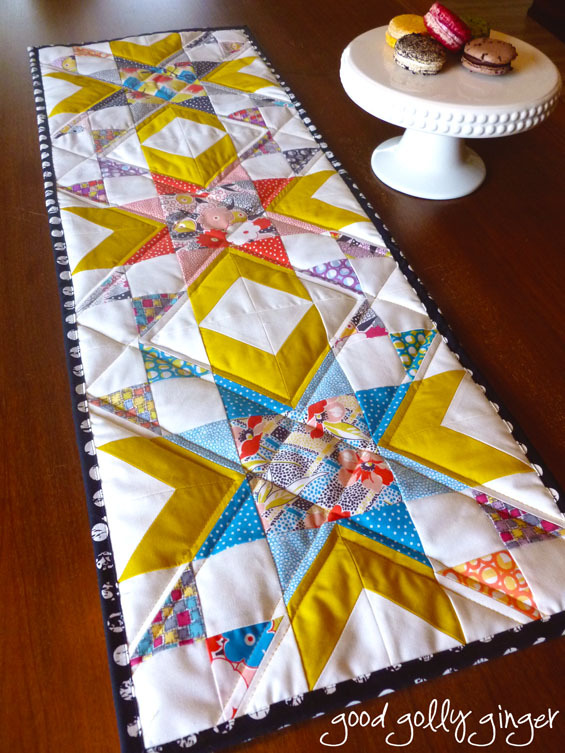 Love your Autumn Star Table Runner!! It's gorgeous! You made a cute Runner with your blocks. Thanks for sharing the Folded corner Clipper. I didn't know Lori had that one. Heading back to the FQS to get me one! Beautiful fabric choices for the block! The runner looks great and the binding is perfect! I also love your fabric choices; especially that yellow solid is gorgeous... I'm a bit jealous. Your block and table runner turned out gorgeous. Love your fabrics.